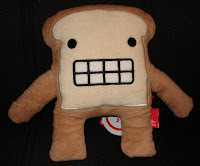 Toast is a heal [sic] from a loaf of wheat bread so he is always getting left behind. Toast doesn't care though, he is a tough gogetter [sic]. He doesn't wait around for anyone anymore. He likes to just get out there and try new things and see what adventures the day has in store for him. He is always positive about every situation and never gets upset. Why is it every time I get near this little toy, he heads straight for my hips? I'm so glad you like him! :) Be careful, he is allergic to butter!